What is the difference between severe stress and depression? Stressed or depressed or both? Can you understand anything from the above statement? Lets' throw some light on facts and figures related to the today's topic. An individual has a higher risk of developing depression in case s/he had been exposed to stressful events in the past. Sometimes, a critical incident can lead to depression and anxiety. It has been found that depression can develop with some obvious reasons. According to the National Institute of Mental Health, depression can affect your body. Some common symptoms are Headache, Stomach problem, shortness of breath. As per a research article, there is a difference between the normal and depressed brains. When a person is depressed the brain circuits work differently. If an individual is depressed for a long time, then depression may lead to other health problems such as diabetes, heart disease. Though there are symptoms of depression which can be used to detect whether a person is depressed or not still in many cases the depressed person doesn't look as if s/he is depressed. S/he may be laughing, joking or making fun of yours but inside S/he may be struggling from stress. You may not believe but at times even the person suffering from depression has no idea that S/he is ill and needs treatment. In the layman language, we as a human being needs to increase awareness about depression and its ill effect on body and mind. Increase your physical activities or exercise at least for 30 minutes every day to reduce your depression. Exercise releases the hormones responsible for happiness in your body and thus, makes you feel better. According to the WHO, depression is one of the leading cause of disability. Most of the depression patients say their brain doesn't work properly and they aren't able to take a decision. The worst part is depressed persons aren't sure of themselves and thus, need a lot of effort even for a very small task to perform. It has been found that warming up can help a depressed person. Running until sweating, hot yoga, a hot shower etc can be of great help. Therapy such as cognitive behavioral therapy can be of great help but for getting the best result, antidepressant medication may be used to alleviate the depression initially. Before we throw some light on facts and figures related to stress, let's have a look at some of the handpicked articles. How to handle a stressful situation at work? You may not believe but when it comes to stress symptoms, women exhibit more physical symptoms of stress as compared to men. At times, stress can overburden your mind with incessant worries. For example, your mind will bombard you with the thought of to-do list, negative thoughts, and future worries. The mind will try to blur the positive aspects of any task. Slowly and gradually, your environment will turn into the hub of the negative thought. An exposure to stress can make you feel jittery because of the hormonal release such as adrenaline. An acute stress can make you feel hot and nervous because of the rise in the blood pressure. When you are stressed your body goes into "fight" or "flight" mode. As a result, cortisol aka "stress hormone" is released in the body to cope with the perceived threat. Due to the release of cortisol hormone, blood sugar, blood pressure, and heartbeat increases. Excessive urination, stomach upset, diarrhea are some of the common symptoms of stress. An exposure to chronic stress for a long time can lead to anxiety and depression. A very common but frequently ignored symptom of stress is Insomnia. You may develop rashes due to stress. These types of rashes are called stress rashes. People experiencing chronic stress on a regular basis can be more prone to cigarettes, narcotic drugs, and alcoholism. Frequent encounter with the stressful situations can have a hard on an individual's immune system. Stress can affect the woman menstrual cycle in a negative way. People suffering from chronic stress are found to have a higher risk of type2 diabetes. Lack of family support can make the stressful situation worst. Racing thoughts and inability to focus. Having difficulty relaxing and quieting the mind. Facing difficulty in controlling worry. Having an increase in heart rate. 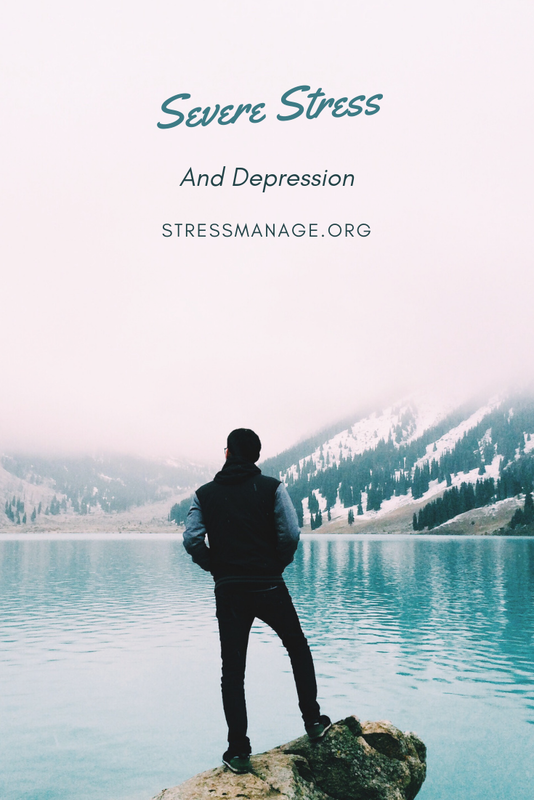 Though you can find some similarities between stress and depression still there are lots of differences which is important to distinguish between stress and depression at the early stage. Stress is a problem we have to deal with day to day basis but depression is a much serious mental problem which can even lead to suicidal thought. A prolonged stress may lead to illness condition such as depression but stress itself is not a mental condition. Depression is a low mood that lasts for a longer time, and negatively impacts your day to day activities. The main difference between stress and depression is that depression is characterized by a feeling of hopelessness, isolation, sadness, and unable to relate to others. It has been found that a depressed person will slowly and gradually withdraw from the social circle. Wrapping Up: I hope you will like this post. Please let us know your feedback. Depression is a serious mental condition and if detected early, it can be cured easily. In case you find someone suffering from depression, educate him about the consequences of depression if not treated on time.